The Jhula's arched back is inspired by the swings from the Maharaja's court. 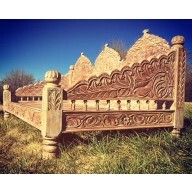 Every detail has been careful carved into the entire love seat. The arms have scales carved into the inside angle, with an ornate carving on the exterior of the arms. The front panel is delicately hand carved as well, in a floral leaf pattern, and the carved arched back feature a delicate 3 petal flower topping each arch, and below the arches there is an interwoven lattice carving. It takes many weeks to perfect each piece. 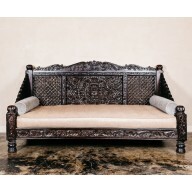 The Arch Carved Jhula Seat is hand crafted from solid Indian Neem Wood, of the Mahogany family. Neem is a natural pesticide and a solid dense wood ideal for furniture production. Outer Dimension Single Seat: 38wx36dx35h"
The Jhula's arched back is inspired by the swings from the Maharaja's court. 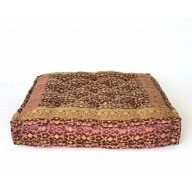 The Arch Carved Jhula Seat is hand crafted from solid Indian Neem Wood, of the Mahogany family. Neem is a natural pesticide and a solid dense wood ideal for furniture production. They are carefully constructed by hand by a family of craftsmen in Rajasthan, India. Finished in a blue antique finish. The Jhula's arched back is inspired by the swings from the Maharaja's court. 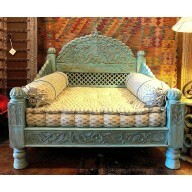 Every detail has been careful carved into the entire love seat. The arms have scales carved into the inside angle, with an ornate carving on the exterior of the arms. The front panel is delicately hand carved as well, in a floral leaf pattern, and the carved arched back feature a delicate 3 petal flower topping each arch, and below the arches there is an interwoven lattice carving. It takes many weeks to perfect each piece. 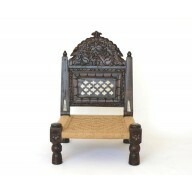 The Arch Carved Jhula Seat is hand crafted from solid Indian Neem Wood, of the Mahogany family. Neem is a natural pesticide and a solid dense wood ideal for furniture production. Finished in a light percentage paint finish. 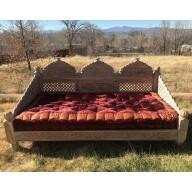 Outer Dimension Single Seat: 38wx36dx35h" Love Seat: 44wx41dx35h"
The Sari Cushions are made from traditional Indian Saris and filled with natural cotton and polyfiber. They are hand stitched with tufting on the top and framed with an embroidered border. 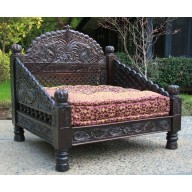 They are designed and produced by Worldcraft Industries in Rajasthan, India and imported into the USA. Ships from NM, USA. Designed for the low Indian seating. The Tufted Velvet Mattress is hand stitched from rich velvet with an embroidered 3" border. Velvet Mattresses are filled with cotton and poly fiber stuffing for durability and comfort. 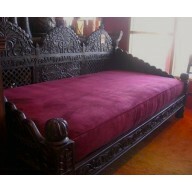 The Tufted Mattress fits Worldcraft's Jhula and Lotus daybeds perfectly. 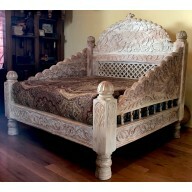 Made by hand in Rajasthan, India and imported into the USA. Ships from NM, USA.